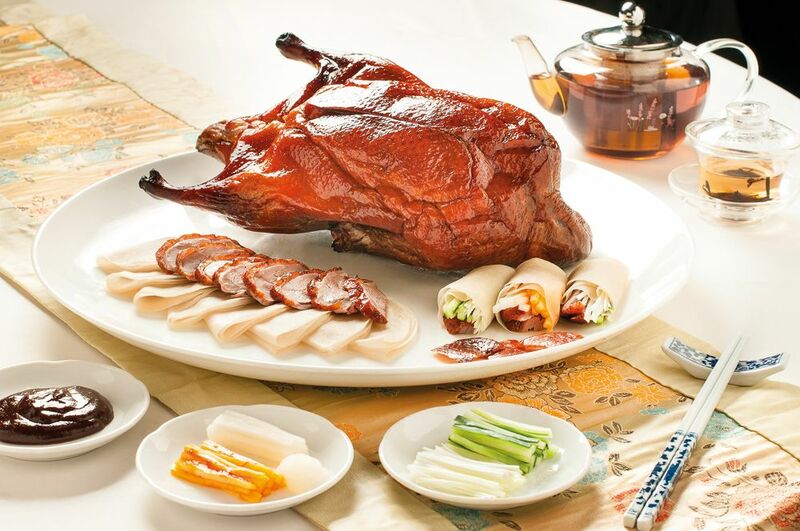 The epitome of any Chinese feast is one with a Peking duck served in the middle of the dining table. A treat for the whole family, it’s always enjoyed for its skin that crackles on every bite and the tender meat that overwhelms the palate in a good way. Even better is when you dab a bit of sugar on the skin; add hoisin sauce, sliced cucumbers and scallions before you wrap it with a thin crepe. Bite into it and you’ll easily understand why this dish was served to Chinese emperors in the past. Here’s some of the best restaurants serving this dish. While there are so many reasons to visit the renowned Chinese restaurant at Four Seasons Hotel — the newly-refurbished interior, attentive service, sumptuous food and fine wines — we narrow it down for you with one special dish: Roast duck. Known as one of its signatures, the chef takes up to 14 hours to prep this dish before it’s roasted in a customised mesquite oven. The result? A golden brown duck that’s bursting with flavours from the skin to the meat. It’s served with two types of wraps (plain and flavoured) together with homemade sauces, cucumber and sugar. What would make us travel all the way to One North? Five words: legendary wood-fired Beijing duck at Min Jiang. It has earned a reputation as one of the best ducks for a good reason. It’s prepared by the Chinese chefs using an ancient recipe that has remained a secret until today. Served with eight different condiments, the chef skillfully scarves the meat in front of your eyes. Just looking at the tender meat with thin and crispy skin is enough to make your mouth water. And when it’s served with the wrap and other ingredients, it’s just heaven on the palate. When a restaurant has the words “imperial” and “treasure” attached to its name, you’ll expect great things from its dishes. Fortunately, the kitchen team delivers especially with its menu and the signature item — super Peking duck. Prepared by Chinese chefs, the duck undergoes hours of preparation (hence, orders should be made three days in advance) before it’s cooked in a wood-fired oven using lychee wood. The special way it’s roasted gives the meat a smokey flavour with just a hint of lychee. Of course, our favourite is still the skin which remains as crispy as ever. The restaurant is a collaboration between Tunglok Group and Beijing’s XiHé Group, which is famous for its Peking duck. Therefore, it doesn’t take a rocket scientist to know that the star of the show here is the traditional Peking Duck. This version is smaller in size due to the fact that it’s bred for 40 instead of 60 days; so the meat is softer and tastier because of longer preparation process it takes to ensure that all the flavours are in every bite. Located in the heart of Orchard, Wan Hao is the restaurant to visit when you suddenly crave for Peking duck after shopping. The kitchen team makes sure it’s worth the trip by offering you a version that stays true to the traditional way it is cooked. Prepared by Cantonese master chefs, they begin the preparation of flavouring and hanging the duck to dry days in advance. When it’s ready, they roast it in a special oven until it achieves that oh-so-crisp skin and succulent meat. Like all Peking ducks, it’s served with traditional Chinese crepe and usual accompaniments to complete the meal.